Sadly, Americans are staying out of the kitchen, which makes it challenging to eat healthfully. Learn how providing a culinary education can inspire people to don their aprons again. Despite farmers’ markets, celebrity chefs, the Food Network, and best-selling cookbooks, many people don’t—and even worse, can’t—cook. The old ideal of families gathered around the dinner table for a wholesome, home-cooked meal seems to have gone by the wayside, as people lead busier lives and no longer relish the art of cooking. To make matters worse, many people who cook meals at home aren’t really cooking, per se; they’re merely heating up convenience foods and calling it cooking. About 90% of Americans purchase convenience foods, and nearly 25% use more time-saving convenience foods today than in 2001.3 So it’s no wonder that the convenience food industry is burgeoning. While food companies have made great strides in creating more healthful convenience food products, made from whole-food ingredients and without added sugar, salt, or preservatives, many convenience foods don’t measure up and hardly help people meet their goals for a healthful eating pattern, such as the DASH eating plan or Mediterranean diet. It’s easy to find convenience products with more than 1,000 mg of sodium per serving, yet there are fewer products that include desirable ingredients, such as whole grains, vegetables, and legumes—the ingredients dietitians encourage clients and patients to consume. “Even with nutritional knowledge, few know how to shop for and prepare healthful yet delicious foods. Culinary literacy is at an all-time low,” said David Eisenberg, MD, an associate professor of medicine at Harvard Medical School, during Healthy Kitchens, Healthy Lives, a conference held at The Culinary Institute of America (CIA) in St Helena, California. “Americans spend less time cooking than many other countries. There are lower rates of obesity observed in countries where individuals spend more time preparing foods,” said Sanna Delmonico, MS, RD, an adjunct instructor at the CIA, who also presented at Healthy Kitchens, Healthy Lives. Why Are People Leaving the Kitchen? Today people are busier than ever, juggling long commutes and workdays with kids’ carpool and sports schedules, and also are plugged into social media 24/7. As a result, more people snack and skip meals. In fact, one-fourth of daily calorie intake comes from snacks, according to Laura Hershey, MBA, RD, health and nutrition manager for Daisy Brand Cottage Cheese, who reported on eating trends at the Supermarket RD Symposium in Dallas in February. At the same time, more places, ranging from car washes to train stations to bookstores, offer food choices, making eating away from home an even easier alternative. Top it off with the fact that cooking education is all but nonexistent in American schools and it stands to reason why people have ditched mixing bowls and wooden spoons in lieu of simpler solutions. More and more, health care professionals are recognizing that it’s impossible for their patients to meet their goals—a healthy weight; normal lipid, glucose, and blood pressure levels; and chronic disease prevention—if they’re not eating home-cooked meals. In fact, this is the theme of the Healthy Kitchens, Healthy Lives conference organized by the Harvard School of Public Health and the CIA. Every year health care professionals, including physicians, dietitians, and nurses, attend this conference in droves to learn how to help their patients find optimal health through the power of cooking. Over the three-day conference, they watch James Beard award-winning chefs prepare flavorful, healthful meals inspired by the cuisines of Italy, Greece, Mexico, North Africa, and other countries. They even get a chance to acquire skills in the CIA classroom alongside professional chefs. The goal of Healthy Kitchens, Healthy Lives is to inspire health care professionals to bring back their newly found talents to their practices at home. Healthy Kitchens, Healthy Lives is Eisenberg’s dream child, as he’s passionate about the power of cooking in disease prevention. He’s on a mission to put culinary education front and center in health care as well as in education and the workplace. He envisions a world that finds hospitals, schools, and worksites equipped with teaching kitchens—places where individuals can learn nutrition facts, basic shopping and cooking skills, personalized instruction in exercise, and mindfulness alongside health care professionals who serve as role models and teachers. Consumer surveys repeatedly indicate that taste is king when it comes to consumer food selections. However, for too many years, nutrition messages have not favored delicious food. Thanks to the Mediterranean diet, there’s new recognition that healthful foods—olive oil, flavorful herbs and spices, and delicious ingredients such as avocados, nuts, dates, and wine (in moderation)—are delicious. She adds that nutrition by the numbers isn’t always the best approach. Instead, it’s better to focus on dietary patterns, whole foods, fat quality instead of quantity, and reducing sodium by consuming fewer processed foods and cooking with whole foods and a moderate amount of salt. 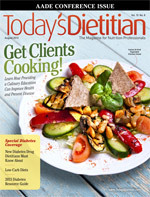 Resources such as the CIA and the Food and Culinary Professionals Dietetic Practice Group (www.foodculinaryprofs.org) may be helpful for RDs as they incorporate culinary education into their practices. But make no mistake, whatever your scope of care—whether you’re a diabetes educator, clinical dietitian, or you work in a long term care facility—you can help make your mark on public health by helping people find their way back into the kitchen. 1. Start small. If people have little experience in the kitchen, take baby steps toward getting them cooking, such as teaching them how to make a simple vinaigrette, cook whole grains, and make a vegetable soup. 2. Create a guide to local cooking resources. Make a list of free cooking classes in your community at various organizations, supermarkets, and community centers to distribute to clients. 3. Develop a top 10 recipes list. Create a list of your best recipes divided into food categories, such as salads, side dishes, entrées, and desserts, as a resource for clients. 4. Provide cooking tips. Tell clients how to prepare grilled chicken breast and whole grain pasta tossed with tomatoes and olive oil, for example. 5. Teach clients to spice it up. Some of the best ingredients to have in any kitchen are various herbs and spices that can add flavor and health benefits to foods. Teach clients how to incorporate these seasonings into their everyday meals. 6. Schedule a cooking demo. You don’t need a cooking facility, overhead mirrors, and fancy lighting to do a cooking demonstration. A blender, hot plate, or even a cutting board will suffice. Even if you don’t have a place to host a demo at work, you can volunteer to conduct one at your local community center, church, or after-school program. 7. Host an ingredient tasting. If you don’t have the resources to conduct a full-on cooking demo, you may want to consider an ingredient tasting when people can sample and compare foods such as olive oils or leafy greens. 8. Demonstrate simple produce preparations. Budding cooks can learn how to prepare fruits and vegetables, especially those that may be a little complicated, such as artichokes, mangos, and avocados, or those that are unfamiliar, such as kohlrabi, bok choy, and kumquats. 9. Discuss menu planning. This is a fundamental tool that can help people get dinner on the table quickly after a hectic day. Meal planning education should include teaching about menus, shopping lists, pantry staples, and easy recipes. 10. Nurture intuitive cooking. When your grandmother cooked meals three times a day, she didn’t have an iPad or Whole Foods around the corner. She simply looked in her pantry or kitchen garden and made something from what was available. Teach this skill by putting a bag of groceries on the counter and showing people how to make a meal out of it. 11. Explore healthful cooking on a budget. Dispel the myth that healthful cooking is expensive by teaching people about wholesome, economical cooking that includes grains, legumes, and seasonal produce. — Sharon Palmer, RD, is a Los Angeles-based food and nutrition writer. She’s the author of The Plant-Powered Diet, the editor of Environmental Nutrition, and a contributing editor to Today’s Dietitian. 1. Combine oil, garlic, rosemary, and 1/4 tsp salt in liquid measuring cup. Combine chicken and half of oil mixture in bowl, and let marinate for 30 minutes. Toss vegetables with remaining oil mixture in separate bowl. 2. Grill chicken and vegetables over a medium-hot fire until chicken is cooked through and vegetables are well-browned and tender, 8 to 12 minutes, flipping often. 3. Arrange chicken and vegetables on serving platter. Garnish with basil. Season with salt and pepper to taste. Serve with warmed pita bread. 1. Combine the rice, lentils, water, and 1/4 tsp of salt in a medium saucepan. Bring to a boil, lower the heat to a simmer, cover, and cook undisturbed (with a heat diffuser underneath, if you have one) for 40 minutes. If the rice isn’t tender enough at this point, pour in up to 1/4 cup of additional water and cook it a little longer. (The lentils will remain somewhat al dente.) When it’s done to your liking, turn off the heat and fluff with a fork to let steam escape. 2. Meanwhile, heat a large 10- to 12-inch skillet over medium heat for about a minute, then add the oil and swirl to coat the pan. Toss in the shallots or onion and cook, stirring, for 5 minutes. Stir in the mushrooms and garlic with 1/4 tsp of salt, and cook for 5 minutes, stirring often. Add the lemon juice and continue to cook for just a few minutes longer, or until the liquid evaporates and the mushrooms are nicely dried out and beginning to brown, sticking slightly to the pan. Mix from the bottom of the pan, scraping up and including whatever may be stuck there (always the most flavorful part) and turn off the heat. 3. Transfer the cooked rice and lentils to the mushroom mixture, stirring and fluffing it with a fork. Add more salt, if necessary, and add black pepper to taste. 4. Serve hot or warm, with lemon wedges tucked in, if desired. You also may want to pass around some white truffle oil to drip delicately on top. This will keep for several days in a tightly covered container in the refrigerator. It reheats well, covered, in a 250˚F oven or toaster oven or in a microwave. 1. Heat the chicken stock or water to boiling. Add 1 T canola oil and salt to taste. Pour in the couscous, gently stirring. Simmer, covered, on low heat for 2 to 3 minutes. Turn off the heat and let sit for 10 minutes. Gently fluff with a fork. Set aside. 2. Add remaining ingredients to couscous and adjust seasonings. Serve. 1. Cut off the stems on the spinach, chop the leaves coarsely, and wash them well in a few changes of water to remove all sand, then drain. 2. Heat the oil in a very large sauté pan over moderate heat. Add the onion and cook a few minutes. Add the garlic and spinach leaves; cook in their own moisture, stirring often until the spinach wilts. Add the mint, mix well, and season to taste with salt and pepper. Top with chopped walnuts and yogurt. *As a salad variation, chill the cooked spinach mixture and fold in the yogurt after the mixture is cold. Top with the chopped walnuts and mint. ReadCustom Default/Default.aspx. July 27, 2010. Accessed April 5, 2013. 2. Smith LP, Ng SW, Popkin BM. Trends in US home food preparation and consumption: analysis of national nutrition surveys and time use studies from 1965-1966 to 2007-2008. Nutr J. 2013;12:45. 3. Harris JM, Shiptsova R. Consumer demand for convenience foods: demographics and expenditures. J Food Distrib Res. 2007;38(3):22-36. 4. Food expenditures. USDA Economic Research Service website. http://www.ers.usda.gov/data-products/food-expenditures.aspx - 26634. Accessed April 5, 2013. 5. Fryar CD, Ervin RB. Caloric intake from fast food among adults: United States, 2007-2010. NCHS Data Brief. 2013;2(114):1-8. 6. Schmidt M, Affenito SG, Striegel-Moore R, et al. Fast food intake and diet quality in black and white girls: the National Heart, Lung, and Blood Institute Growth and Health Study. Arch Pediatr Adolesc Med. 2005;159(7):626-631.